A flat soffit, spans to 3.9m (double span un-propped) subject to profile gauge and slab depth with thinner slabs due to the profile height being 55mm and minimised slab depth to achieve acoustic and fire performance. This could be an option as form-work in Post Tensioned slabs. Other benefits include, added mass for enhanced vibration and acoustic performance, superior point load resistance, and exceptional shear stud capacities in composite beam design. 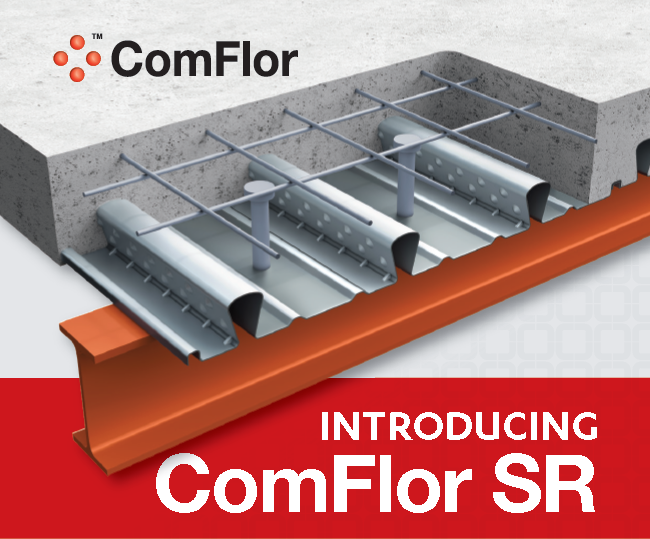 Additionally ComFlor SR has seamless integration with ComFlor 60 and ComFlor 80 due to the lap compatibility and simplified, fast installation due to the 600mm sheet width and the availability of closed ends on the profile. With competitive pricing and updated ComFlor software now available, call us today on 09 271 1788 to see if this profile is right for your next project.